A stony track leading away from the road signposted Morston Quay takes you to the enchanting, wide open spaces of Morston's marshes. Varied saltmarsh vegetation edge the muddy creeks and pools where swans idle their time away. Mud paths snake through the saltings and good views of the Blakeney Channel lined with its compliment of fishing boats and pleasure craft can be seen. 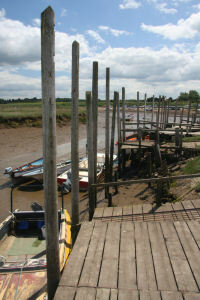 Boat trips operate from Morston Quay to view the seals at Blakeney Point, from April to October (tel: 01263 740038).